The best part about accessories in the action camera ‘universe’ is they are all interchangeable (especially mounts), hence the ones that work with say, Yi, will work fine with SJCAM and GoPro and many others so you don’t have to buy mounts specifically made for your action cam! Without further ado, let’s cover some of the best accessories that I’ve used and why that is so! One of my favourite accessories when travelling is the selfie stick because it allows you to take really easy selfies and we-fies with your close ones. There are many types of selfie sticks, each with its unique features and uses, and there’s definitely going to be one that fits you the best. Personally, these are some of the selfie sticks I have used and really like! If you’re looking to bring your action cam to the waters, definitely give this a consideration! If you’re looking for a specific one, I would personally recommend the GoPole EVO as other than being floatable and waterproof, it’s really well-built and has an extendable body as well. At the same time, it has a really lightweight body, meaning you can carry all day without feeling tired. If you find that you’re constantly using your phone to view it the footages on your action cam, this might be the best for you. The TELESIN extendable selfie stickcomes with a phone clamp, which can be easily attached on to your selfie stick, so you can easily review your shots as you are on the go. Furthermore, it also has a 180˚ rotation, thus you can easily rotate and capture everything without having to regrip and losing that precious moment. There are many manufacturers that have made selfie sticks that have built-in remote control, giving you a lot more control over your action cam directly from your selfie stick, which makes it really convenient to take pictures and selfie sticks on the go. As the remote doesn’t come with the selfie stick, my recommendation for a cost-effective one that does its job is the ANYQOO remote, which works up to 6 action cams at once. Many of the times, especially when you’re out on your holiday, there’s definitely a nice place to take a group photo and using a selfie stick doesn’t quite do the job as these photos are captured better when used with a tripod. What if I told you that there’s an easy way to transmogrify your selfie stick into a tripod? By using a tripod stand and attaching it to the bottom of your selfie stick, you can easily make yourself a tripod. If you’re interested in getting it, the Vicdozia Selfie Stick would be my personal favourite and recommedation. Or if you want it together with a remote, you can get a mini tripod stand and a separate selfie stick with a remote clip (above). The Gorilla Pod is one of a kind because of the many uses for it, ranging from a tripod, selfie stick to even a clamp. The Flexible, wrappable legs with rubberized rings and foot grips provides your camera with much more stability so you can rest assure that it is secured and not have to worry about it dropping at all! Moreover, with the integrated ball head at the head, you can easily adjust your camera to the orientation you want, without having to fuss too much with it. Also, something you’ve got to know that your camera when mounting is that it isn’t going to be level most of the times, and if you don’t go about adjusting, the shots that you take are not going to be pleasant. Luckily, to fix this problem, they have nicely included a bubble level, to ensure that your shots are always taken levelled, which is a really nice feature to add. This is great for making dynamic, panoramic timelapse which is one of my favourite kind of video photography. If you’re going on self-planned holiday, or anywhere where you have the luxury of time to get some really nice shots, you should really try getting one of these to make your first panoramic timelapse! An action camera can easily film great timelapse videos thanks to its internal timer wide-angle lens. But by using one of these little devices, you can up your game to the next level by adding motion to it. Essentially a fat disc timer with tripod mount above, the rotating time-lapse stabilizer allows you to get really great and visually pleasing moving time-lapse videos! There are a few types of rotating time stabilizers, with the main difference being rotation speed. The most common ones rotate a complete round in 60 minutes & 120 mins such as the Movo or LoveQMall. Personally, I like the 60 mins/round one since you can still further slow it down during post-processing to match the same speed as the 120 mins/round one. Also, if you plan on using it extensively, you can consider getting electronic ones which use batteries instead of mechanical, such as Brinno, Blackbolt or TurnsPro panning head which allows you to adjust varying speed for the rotation. The best thing about using one of these is that there’s barely any setup required for it, just attach, turn and let it do its thing (of course that includes starting the time-lapse recording)! As most of these use a 1/4″ tripod thread, you will need an adapter for your action camera if it does not have a compatible tripod thread, which you can get here. Maybe you have just an action camera. Maybe with a few mounts. Or maybe a plethora of other accessories. Regardless of how much, or little, you bring around with you, I am still a huge advocator of using protection cases, especially if you’re serious about using action camera for a long time. No matter how safe you think your bag is, there’s definitely going to be a chance, no matter how slim, and it’s just a matter of when. How, you might ask? Well, your bag(s), I am guessing your daypack, contains many different threats such as keys, wallet, pens, etc and all these items regardless of how safe you think it is, can be a threat to your action camera. I personally am a victim of it and with just a simple pen without a cover, solely that, ruined my camera and caused the lens to be scratched. Hence, what I’m saying is if you’re interested in using and protecting your cam for a long time, consider getting a protection case. Moreover, it isn’t very expensive and can be used interchangeably, hence, even if you decide to change your action cam, you can still use the same one fine. Using a UV Filter to reduce blue tint. Filters are one of the things that can be easily overlooked because many view it to be a gimmick, which in fact it’s not. 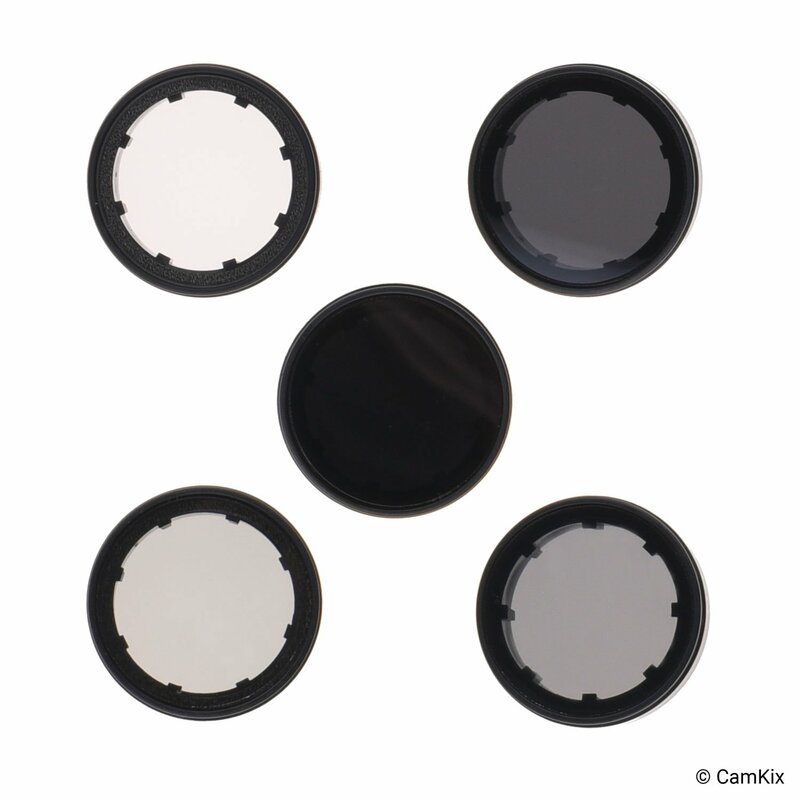 Unfortunately, these filters aren’t interchangeable within action cameras as they all are shaped differently so you’ll have to get the one specific to your action cam. In the real world, there are lots of different spectrum of light that we can’t see but our camera can. Hence, what the camera ‘sees’ is different from how we perceive the world and sadly, 9 times out of 10, what the camera takes is a duller, less accurate depiction of the actual shot. That’s why filters are put in place, with the main purpose of balancing the excess/lack of light and secondary being to protect the lens. There are many different filters each with its own different tint & uses. Most of the times, especially in the outdoors world, where everything is moving all about, wind noise makes it really hard for you to get clear, uninterrupted audio, even with the wind noise reduction feature turned on. Moreover, realising that most or worse still, all, of your shots’ are inaudible due to wind noise is undoubtedly one of the least favourite things to see. That’s why to counter wind noise and this exact problem, foam windscreens are made. Foam windscreens or wind noise mufflers are basically ‘clothes’ for your action cam, which removes wind noise almost entirely, leaving you with crisper, sharper audio. Oh, and in case you were wondering, these foam ‘clothes’ for your action cam are fully interchangeable with any matchbox-shaped action camera so it’ll still be compatible with another action cam if you one day decide to get a new one. Although the waterproof case can seal out the water from coming in, you can’t guarantee there’s not going to be moisture getting in. That’s when the anti-fog inserts come useful. If you are planning on bringing your action cam out to the sea or in wet or cold conditions, definitely bring some of these with you in case the lens suddenly turns blurry. You wouldn’t want to miss shooting a once in a lifetime moment, just because it turns blurry for a second and ruins the entire shot. Moreover, the inserts are reusable, meaning after you’ve used them over a few battery charges (3- 4 charges → about 4 hours), you can heat them out in an oven at about 150˚C for few minutes, to dry them out and use it again. So technically, you can just buy it once and it’ll last a lifetime. It’s also very easy to use it, just insert it into your waterproof case where there’s a gap and it should be all good. Gimbals or stabilizers are arguably one of the most expensive accessories for action cameras due to their intricacy and accuracy. If you don’t already know what gimbals are, they are essentially stabilizers for your action camera, which removes the shakes present in your shot, resulting in a really smooth and cinematic video. Despite its price, I still think it’s worth every penny because it really makes a drastic difference between a shot taken with a gimbal and one without. Anyways, there are 2 broad categories of gimbals, handheld and wearable. To put it simply, wearable ones are more compact while handheld ones last longer (larger battery). Anyways, if you’re interested in checking them out, definitely take a look at my top gimbal recommendations for action cams here! Mounts are one of the few reasons why action cameras, in general, are so versatile and so great for outdoor use. There are tons of mounts available, which cater to practically anything from cars, bicycles, chairs, trees, benches, all the way to helmets, backpack and chest mounts. Another example of a type of mount that’s very versatile in its use is the suction cup mount. Although mostly used in cars, you can actually use it anywhere with a non-porous surface, such as glass, plastic, metal or even some walls. There are heaps of suction mounts out there, ranging from double cups (above) to compact ones. All of that said, the one that I use and personally like the most is the Gorillapod Suction Cup as you can adjust the angles really easily and conveniently. These mounts come handy for attaching onto most surfaces, ranging from surfboards, kayaks all the way to helmets and even skis. 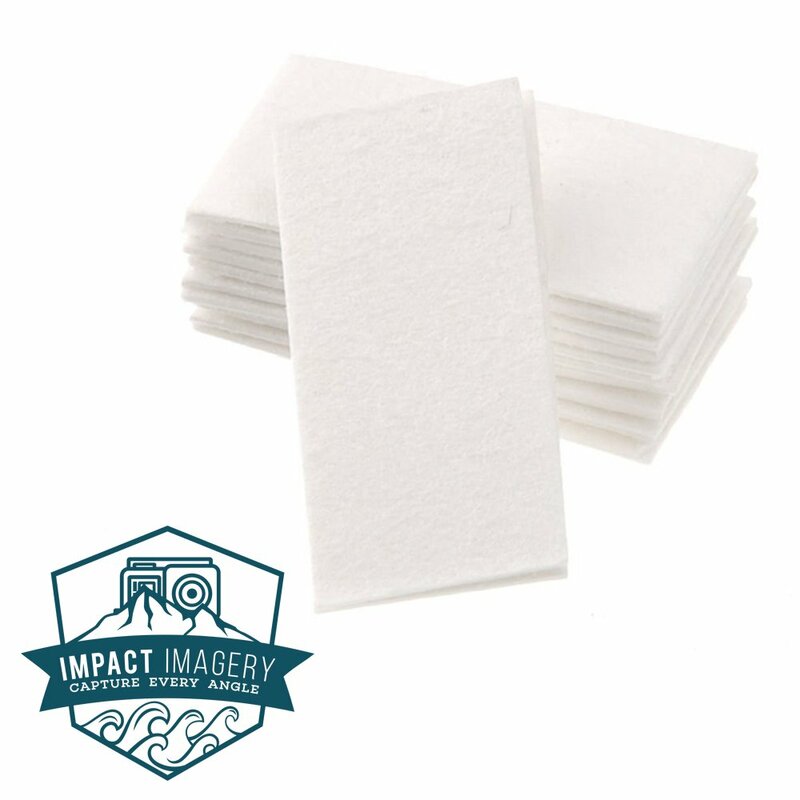 Moreover, they work great for a one-time mounting option as they utilise a very strong adhesive at the bottom to effectively stick and attach itself onto the surface so once you’ve used the adhesive, you’ll not be able to reuse it again. So how do you go about removing it? Well, simple, by using heat to melt the adhesive and latching it out with any sort of non-flimsy card. The mounts below are mounts that specifically attaches directly to you, allowing for more engaging and personalised shots to be taken. This mount is a unique one because it works with anything that has a strap, be it backpacks, belts, life vests or even ski boots. It works with all action cams that use either the 3-fins standard GoPro mount or the ¼”-20 threaded mount so if you have an action cam, be it Yi, SJCAM, GoPro, etc, you wouldn’t have to purchase anything additionally. Moreover, as it secures by using a clamp, you can adjust the tightness of it by simply using the provided wrench for fine tuning. All in all, if you’re looking for a good mounting alternative for your backpack, I’d highly recommend the P.O.V mount as it secures really tightly with your bag, and straps in general. Shooting from the top is also another way of getting really cool handsfree footage! Last but not least for the mounts, we have the handlebar mount, which works great for mounting onto bicycles, but I don’t think it’s that great for motorcycles as the bars are often blocked by the windshield, thus I’ll recommend suction cup mounts for motorbikes use. There are 2 main types of handlebar mount, mainly 1 bolt (left) and 2 bolts clamp (right). Both of them are roughly the same with the main difference being that 1 bolt ones are typically easier to mount, which makes mounting to other things such as seat poles or done more easily. On the flipside, 2 bolts ones, despite their limited versatility, mounts on more securely and reliably. Using a chest mount is a good way for you to film skiing, cycling, motocross or paddle sports in a very immersive perspective and gives your video a unique flair to it as you’ll be able to capture more of your arms, knees, poles and skis while skiing—and more of your arms and handlebars while biking or riding a motorcycle. There are a few kinds, mostly differing by quality but if you’re planning on wearing it for a long period of time at a go, I’d recommend getting better ones such as the CamKix or official GoPro Chesty chest mounts as they generally have a little more cushioning, especially at the shoulders as I found it does help a lot to reduce strain on your shoulders. 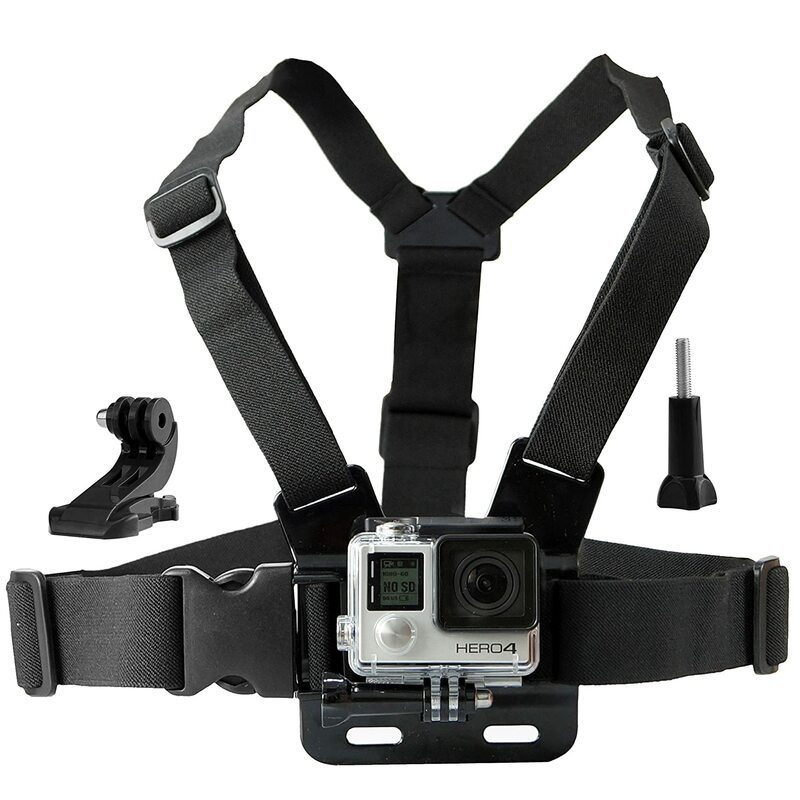 Moreover, as these chest mounts utilise J mounts to mount your action camera, it is interchangeable between action cams and works with almost every action cam (SJCAM, Yi, GoPro, Thieye, Hawkeye…). There is a pretty neat and cheap way of mounting your action camera into essentially anything, from tree branches, poles, all the way to bikes, doors, you name it. It actually utilises a group of mounts called RAM and the core of what makes their mount so easy and effortless is the use of a rubber ball & socket system in all of their mounts, which really makes it so much more convenient because you’re able to fine-tune the position of your camera by simply loosening, rotating and tightening it. The first step is to get an action-camera-to-ball adapter. Afterwards, you’ve got to get another a socket arm for connecting between the mounts and your camera. Though it can be a little difficult in the beginning to get the different parts, it will truly pay off when you’re out travelling by having the ability to mount almost anywhere, using a single setup. Personally, the RAM setup is my all in one favourite I’ve come across because if compared to GoPro mounts, it’s cheaper, more flexible in mounting, and I found it to be more secure than other mounts I have tried. Most importantly though, it makes mounting easier and more fun than before. This comes to the end of the best accessories for gopro and action cameras. If you have any thoughts or think I left out anything, pleaseeee feel free to drop a comment down below and I’ll be sure to reply to it! I had no idea there was so much that went into these types of cameras. I always found them cool, seeing other people’s videos. Maybe I’ll have to get one for myself! I already have the gorilla pod and it’s so helpful while I work on my tutorials, but I was looking some information about the head strap to get more distance while I work on my crafts videos. I will pin your article on my Pinterest account as I find it helpful with good information and I’m sure I’ll get back to read it again. My brother just bought a GoPro and he is using it all the time and I wanted to get him a suitable birthday present. He spends a lot of time in the forest and records some stuff there. I think it is about animals. Anyway I really don’t know much about this stuff but do you think that the Flexible, wrappable legs is a safe choice for his birthday? Accessories for action cameras are certainly good things to know about. You have done a great job showing me how and what my options are. The dynamic panoramic views are always what I aim for in a large beautiful place, like the mountains. Time-lapse videos are hard for me to do so I like your advice here. And the advice about the carrying case is good since the carrying case keeps the items safe from breaking like you say it is a matter of when if you carry devices in other bags.